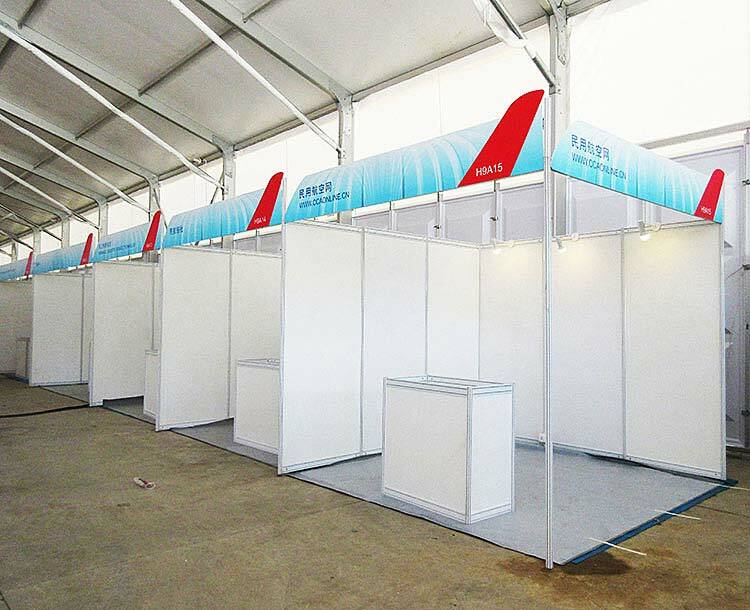 Standard modular trade show booths often consist of fabric panels and aluminum poles. And a exhibition booth display printing designed graphic images will show what presents your brand. Trade show organizers normally provide exhibitors a 10 x 10 booth space facing an aisle. In this space, exhibitors can set up a variety of trade show displays to present their products and services. To attract the attention of visitors, we also provide custom exhibit display stands and trade show furniture you might need. Additionally, other exhibition equipment including display cabinets and display spotlights presenting your products are also optional. Visit our exhibition booths below to read more specifications or contact us now for more details. Modular shell scheme stand, commonly known as hard wall exhibit system, is a modular system supplied to exhibitors. One single shell scheme normally comes in 3x3 meters and can be built to any sizes. A traditional shell scheme consists of plywood panels on a softwood frame and aluminum frame profile. Jiejian supply standard basic shell schemes, so that buyers can make their own design. Changing the color of the panels to match your corporate colors is one of the options. We also provide tailor made ones to meet exhibitors' objectives. Trade show contractors usually provide shell scheme stands for exhibitors who have about 10x10 of stand space. So it is not easy to make your shell scheme stand out from the crowd. Standard 3x3m (10x10') and tailor made. Structures Material: aluminum extrusion profile, wooden, truss system, aluminum pipe frame, tension fabric, mixed material structure. Auxiliary Material: oxford fabrics, acrylic board, polyester fabrics, panel board, tension fabrics, wood with painting, etc. Printing: advanced painting technology, eco-friendly, colorful inks. Accessories: carpet, chatting tables and chairs, sofa, LED screen, plants, etc. A standard exhibition booth often consists of a display designed for a wall surface, which can be a graphic image or a compatible fabric. And a wide variety of graphic images will be printed on the attached substrates. Exhibitors at trade shows are normally provided a 10 by 10 feet (3×3 m) booth space facing an aisle. However, you can also get your own custom trade show booths in creative shapes. Over 20 years experiences in trade show industry since 1997. We can provide the best custom booth you want. Expo booth displays provide exhibitors with a defined area to present company or organization. So as to appeal visitors to attend your booth. 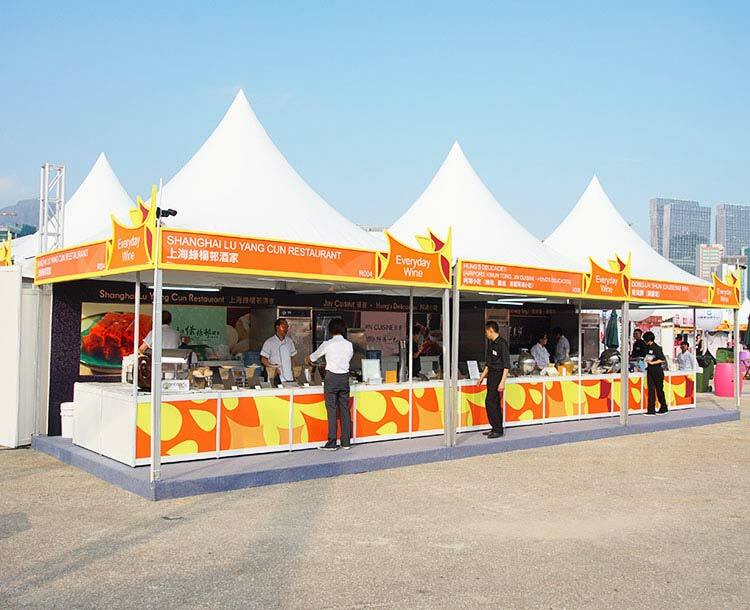 Anyway, using pagoda tents as outdoor expo booths, exhibitors can set up a wide variety of trade show displays and tailor to their specific need in order to present their services. 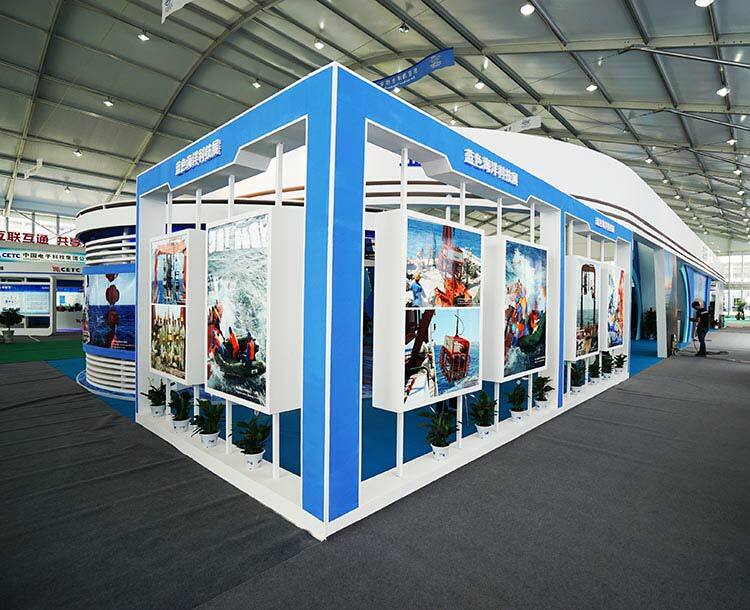 As the leading manufacturer of exhibition equipment in China, Jiejian also provides other types of trade show booths. Modular design makes it flexible for any sizes of area. Best quality at a best price. 20 years experience in exhibition market since 1997. Bases on your needs, we can provide the best exhibition booths you want. If you want to Get A Free Quote for these exhibition tent accessories, chat with us now or type detailed product inquiry. We will get back to you as soon as possible.